As usual, Reception was managed by Mary-jane Pamphilon and when it was especially busy she was assisted by Lily Hawker-Yates, one of the Centre’s ‘Welcome Team’. Lily was not the only postgraduate helping on Saturday because Andy Leach was also present. The Centre is extremely fortunate that several Associate Lecturers are similarly prepared to help, and I am equally grateful to Dr David Budgen and soon-to-be Dr Harriet Kersey. 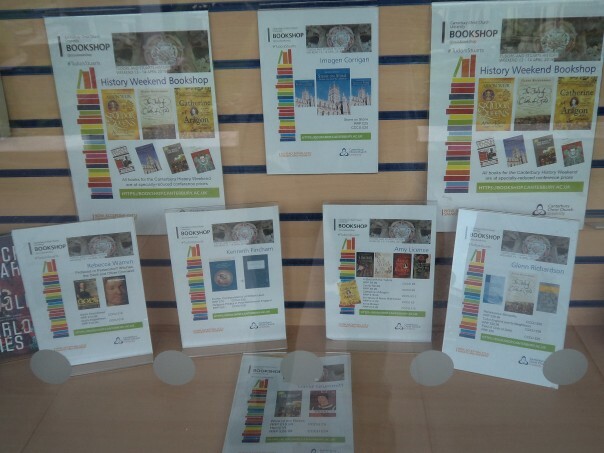 Nikki Gregory, a librarian at CCCU, has become a regular helper since the Tudors and Stuarts History Weekend in 2017, and, as always, Dr Diane Heath was my co-organiser. I should also like to pay tribute to the staff from Hospitality and Housekeeping who very efficiently and helpfully provided the catering and had set up the necessary tables and chairs, while Terry from the AV Team had come over to the Michael Berry Lecture Theatre on the Friday to check the sound and projection systems. Jackie, Catherine and Stuart with the Lord Mayor and Lady Mayoress. 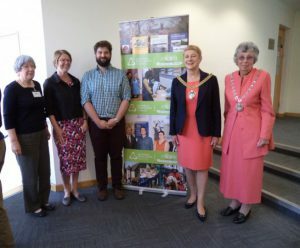 As is customary at such conferences, having gone through the basic housekeeping I handed over the microphone to Cllr Rosemary Doyle the Lord Mayor of Canterbury, who welcomed the delegates to Canterbury and to the conference. As she said, Canterbury’s rich Tudor and Stuart heritage offers considerable scope for talks and walks having links, for example, to emigrants in the form of those who left on the Mayflower for the Americas, but equally for immigrants, the ‘Strangers’ who came from France and the Low Countries to escape religious persecution. For the delegates who had come from across Kent, these features of the city’s history would come to the fore again at different points in the day. Being interested in history and archaeology the Lord Mayor and Lady Mayoress stayed for the first session which featured two lectures on Tudor Canterbury. They and the almost 100 strong audience were not disappointed. 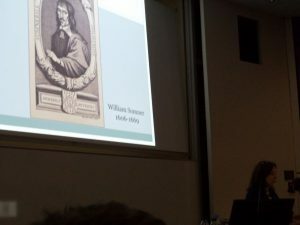 Dr Stuart Palmer was the first speaker and he explored civic hospitality and gift-giving in early Tudor Canterbury. Not that those who gave ‘eight fat capons’ to Master Thomas Cromwell when he visited the city were being especially innovative because their medieval predecessors had similarly given such gifts. However, in the early sixteenth century Humanist ideas derived from Cicero and Seneca sought to stress the civilized nature of such gift-giving – theirs was not a barbaric society. Furthermore, as Stuart said, the diversity of fish platters that the city gave to numerous dignitaries during this period demonstrated the city’s wealth and status – they could command/acquire such diversity not for their own use but to honour others. Fish seem to have been a favourite, but other victuals used in such gifting were a range of wines (spiced, red, sweet), various fruits, whether seasonal apples or pears, or more exotic items like oranges, delicacies such as sugar loaves and cakes, as well as a range of nuts. Although generally such staples as bread and beer were not within this repertoire except at election time. 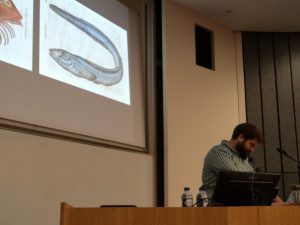 Stuart discusses the giving of fish as gifts. Interestingly, what we know far less about is how this gifting took place. Stuart believes that at times such gifts would have been handed over at the guest’s lodging, but others may have been given as part of the ritual of greeting the guest at the boundary of the liberty – those coming from London entering the city’s jurisdiction at the Westgate from whence they were escorted possibly to the cathedral or their lodging place. Stuart was followed by Professor Catherine Richardson, who took her audience through Christchurch gate and into the precincts of Canterbury Cathedral to ‘meet’ the community of the New Foundation of the Dean & Chapter formed after the dissolution of the monastery. Catherine is extremely interested in the use of space and of objects – material culture, and in terms of the cathedral precincts the changing scene from communal, almost exclusively male to a smaller community that included married clergy, often with children, had considerable implications for the uses and understanding of these spaces, and the relationships various people – individually and collectively, developed within them. For example, matters of hierarchy continued to be important and to be recognised, whether it was the great size of the new deanery that encompassed the ousted prior’s new lodging, or towards the other end of the scale, the 12 lay clerks who were housed mainly on the old dormitory site, so continuing the far more communal style of living of their monastic predecessors. In addition, some of the Six Preachers were rarely present, residing primarily in their parishes, and yet as a more transient group, their presence/absence affected the precincts community, especially during periods of dissent and strife that erupted publicly during the Prebendaries’ Plot of 1542. Catherine explores different spaces in Canterbury. Catherine also discussed what we can learn from wills and inventories about these different living and working spaces, decoration is an especially good indicator in that in this post-Reformation world where a painting of St Jerome had moved from a devotional space – a monk’s cell, to a display space – a gallery. As Catherine reminded her audience, anyone who has been programmes such as Wolf Hall will appreciate how these long galleries had become spaces to demonstrate taste, fashion and wealth. In contrast to this ecclesiastical space that she sees as being in a state of flux in the century after the 1530s, she considers secular, especially commercial space within the precincts changed relatively little over this same period. The small rows of shops inside Christchurch Gate continued to be leased to a variety of artisans and traders, and we know something of such activities from church court depositions. Another especially valuable piece of evidence that Catherine has employed to determine such daily living is Thomas Cox’s account book. As the cathedral receiver, he received rents from many people, and this meant he knew and was known by a large section of Canterbury’s population. Moreover, he appears to have cultivated such relationships and one of the ways he did this was through the lending of his books. Consequently, Catherine has traced with whom and where he dined, as well as his rent collecting and book sharing activities, and it is though such individuals she was able to give her audience a rich tapestry of human relations in the precincts under the late Tudor and early Stuart monarchs. 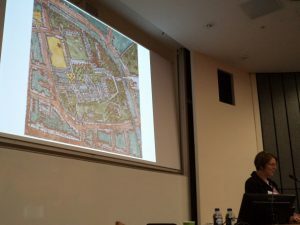 After a break for refreshments, the audience returned to hear Charlotte Young (Royal Holloway, London) explore the history of the St Augustine’s Abbey site in the 1640s when it was the residence of Lady Wootton. Although initially a minor royal palace after the dissolution, as some discovered in the afternoon, from the mid-1620s it was in the hands of Edward Lord Wootton as the Crown’s lessee. However, Lord Wootton died in 1626 and thereafter the house was held by his second wife until her death in 1659. But this was a difficult widowhood because in the mid-1640s Lady Wootton had to deal with Parliament’s actions against her when they sequestrated a large part of her property and rents (the officials were charged with removing two-thirds of the property, leaving the family with a third to live on). Even though this was extremely unfortunate for Lady Wootton, Charlotte has unearthed a treasure trove of documents at The National Archives covering the sequestration and Lady Wootton’s attempts to mitigate the problems she faced due to the government’s actions. Among the surviving inventories is one for Lady Wootton’s residence and deer park at St Augustine’s. As Charlotte noted, the appraiser(s) raided 47 rooms and the park but not Lady Wootton’s personal apartments. These ranged from the study and gilded chamber to the buttery, kitchen and servants’ quarters, as well as the brew house, bake house and hay barn. Some of the livestock were taken, but the 200 deer in the park were left alone. Normally, such household and estate ‘stuff’ would have been taken away in carts to a storehouse and then sold off in the market place. This did not take place at St Augustine’s, rather the mansion appears to have become some sort of Aladdin’s cave and the stuff was sold off piecemeal over a period of 7 months, and Charlotte’s second inventory gives us the names of the buyers, albeit the document is badly damaged so matching up items and buyers is now impossible. Charlotte considers the second inventory. Subsequently, Lady Wootton tried to mitigate the damage to her estate whilst it was under governmental control, but when it was finally returned to her it was in a poor state. During her later years she also faced family problems, and after her death the palace reverted to her late husband’s family, passing eventually to the Hales family. They never actually lived there, and Charlotte concluded that she believes it was this period in the 1640s that should be seen as pivotal in the palace’s downfall from a major aristocratic residence to becoming little more than a romantic ruin. 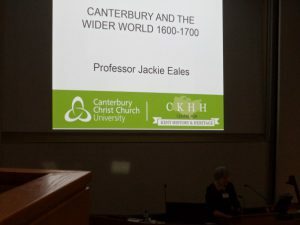 Charlotte was followed by Professor Jackie Eales who drew on several case studies to show how outward looking many members of the Canterbury gentry were during the 17th century. In part this was due to the excitement of the New World and the commercial opportunities presented by these new lands, especially in Virginia. However for others, the Americas presented a place where they could escape the religious restrictions and persecution found in England, and there is a strong link between Canterbury and the Mayflower, Robert Cushman having served as an apprentice in the city. Yet it was not just the New World that drew men from Canterbury and the Tradescants’ (father and son) collection of exotic plants were taken not only from the Americas, but from Russia and north Africa. This idea of looking east and to Africa was enthusiastically embraced by others, and for Canterbury the best known is John Bargrave from his still surviving cabinet of curiosities, now held in Canterbury Cathedral Archives and Library. Yet Bargrave should also be remembered for his activities in saving captives in Algeria who had been taken by pirates, his intervention symbolised by the slave chains set above his tomb. Of course, not everyone was able to emulate such travels and this period is also marked by the production of maps, whether of the world, or detailed maps showing cities and fortifications. Many of these were for display, as seen in the probate inventories Jackie referred to in her lecture (collected by Dr Valerie Newill and other researchers as part of Jackie’s ‘Canterbury 1641’ project). This excitement about maps, and also travel books was matched by a growing curiosity in the past, and the desire to collect Roman pots and other objects meant the gentry and their clerical peers would exchange finds as they built up their personal collections. All of this Jackie concluded gives us exciting insights into how such men viewed themselves as part of a much wider world than the narrow confines of Canterbury, Kent or even England. After this fascinating morning of talks, the Rev. Dr Peter Rowe, as secretary of the Kent History Federation, thanked the speakers and mentioned that the Federation is looking for a host society for next year’s conference. Then participants adjourned for lunch, many taking advantage of the university’s catering services before returning to hear Avril Leach, who like Charlotte is in the final stages of completing her doctorate, discuss William Somner whose 350th anniversary falls next year. The intention is to hold a day conference on him in 2019, and her talk last Saturday was intended to alert people to his importance and why his achievements should be celebrated. As Avril said, Somner is probably best known locally for his Antiquities of Canterbury, but he wrote several books, including an Anglo-Saxon dictionary. 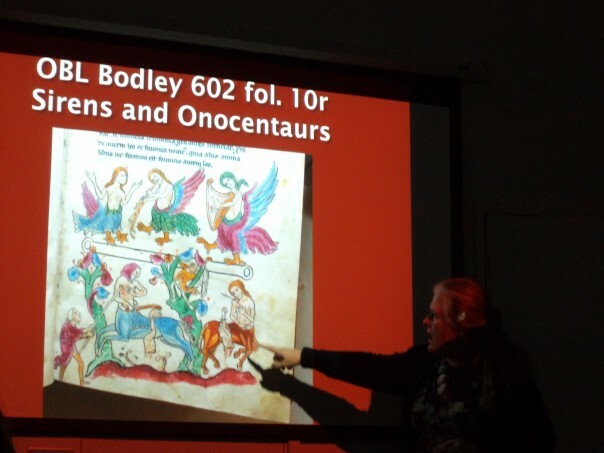 Avril took the audience through his life and achievements against the backdrop of various surviving copies, including his own annotated copy of Antiquities. This was a fascinating introduction to the man, and I shall look forward to hearing more next year. Avril highlights the importance of William Somner. 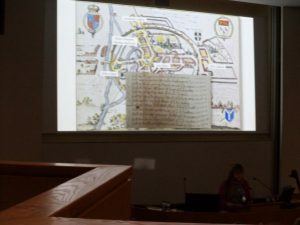 Before most of the delegates set off on the choice of six guided tours around ‘Tudor and Stuart Canterbury’, Jackie Grebby from the Federation thanked the organisers of the conference at Canterbury Christ Church, commenting on the excellent lunch and the smooth running of the day. As one of the tour guides – I was leading the ‘Early Tudor Canterbury’ tour, I’ll just mention the others because I am extremely grateful to Dr Doreen Rosman (‘Strangers’ in Canterbury); Dr Sarah James (Drama and Theatre in early modern Canterbury); Professor Paul Bennett (The King’s School); Peter Henderson (St Augustine’s, a minor royal palace), and Cressida Williams (a special exhibition at the Cathedral Library). Thus, having spent the afternoon exploring an aspect of Canterbury’s history during this period, delegates returned to Old Sessions for tea and cake, and from the many comments I heard it was a very successful day.